The Cedar Springs Lion Club presented a check to Cedar Springs Library Director Donna Clark earlier this month after a two-year fundraising project to help those with hearing and sight problems use library services. Courtesy photo. Those with hearing and sight issues will soon have an easier time using equipment at the Cedar Springs Library, thanks to the Cedar Springs Lions Club. Lions Club treasurer Sue Norton presented a check for $7,078.00 to Library Director Donna Clark, at the annual Lions Club Christmas Party December 5. The money will be used to help purchase equipment for those who are sight and hearing impaired. The CS Lions held several activities to collect funds for this project including a Euchre Party and a Painting Party with local artist Andrea Lucas. They hosted several Poker rooms in Grand Rapids, and a Cedar Springs Brewery community share evening. The club has also been holding a Million Penny Mission for the past 2 years. You may have noticed the yellow jugs at several businesses around town. 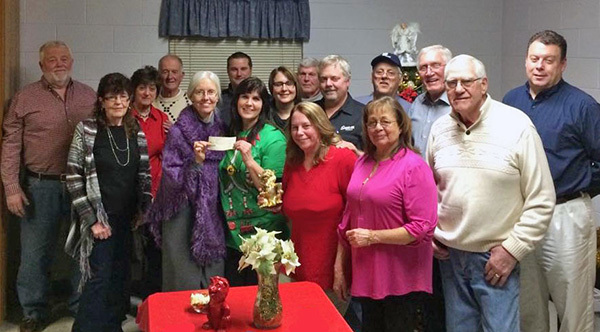 With two years of activities, the Club was able to present the check at the annual Christmas party. Items to be purchased include ZoomText with speech, Freedom Scientific Topaz EZ 24” Video Magnifier with HD Camera, EyePal Solo OCR Reader, Freedom Scientific Ruby 7 Portable Video Magnifier, Hand Held PowerMag Set 3.5x – 10.75, large print keyboard, and large screen monitor. This equipment will make Cedar Springs Library one of few libraries that can offer this service equipment to the public. Look for the collection jugs and join the Cedar Springs Lions Club for more activities in the Cedar Springs area. Follow their activities and pictures from the events on the Cedar Springs Lions Club Facebook page.